There are plenty entry-level snowshoes out there, but the MSR Evo Ascent stand out from the pack. 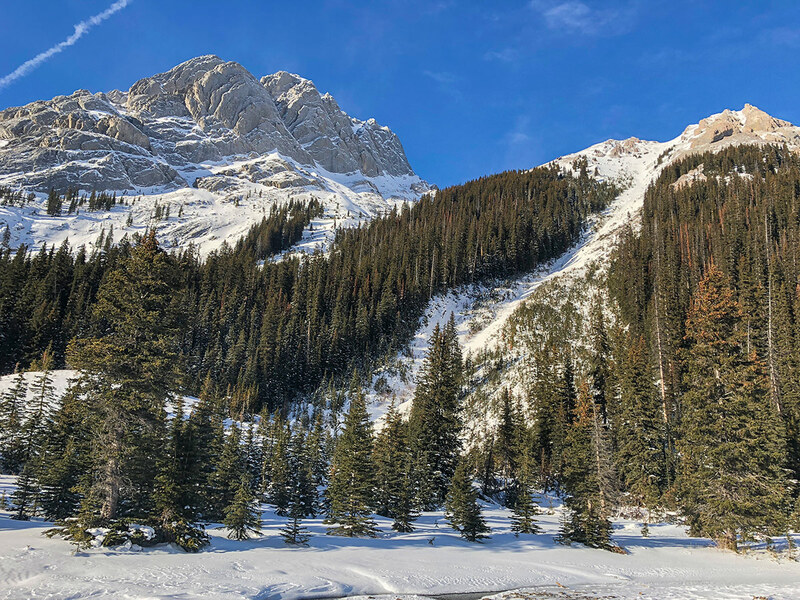 We’ve snowshoed with these snowshoes all over the Rockies this winter, and we’re impressed with how well they help up. 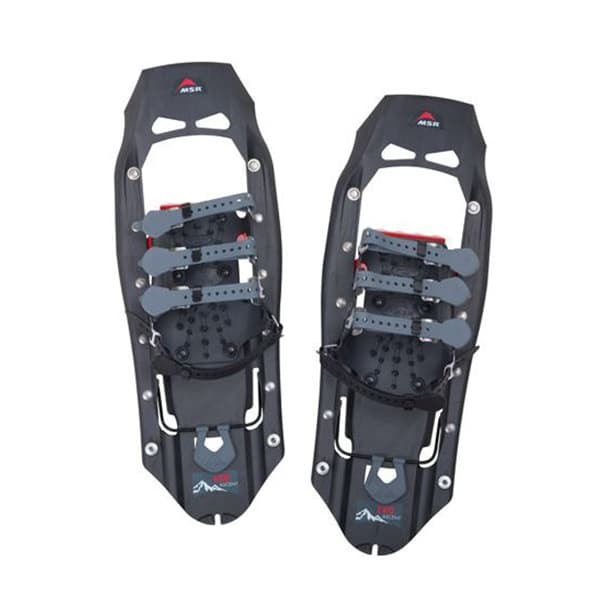 The MSR Evo Ascent are solid snowshoes for all-around snowshoeing. Short enough to remain nimble and comfortable on rolling, rugged terrain, and with a durable-yet-flexible unibody construction that can handle virtually anything you throw at them, these can go almost anywhere your winter treks take you. 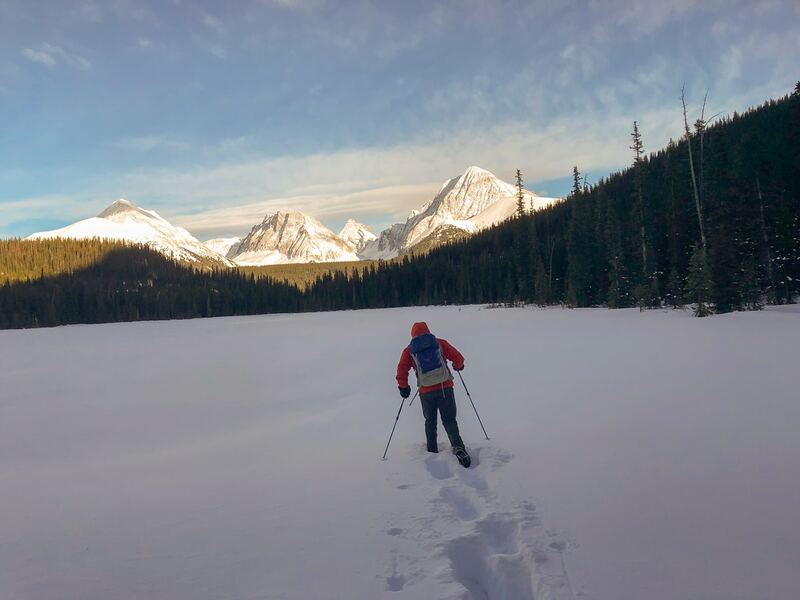 The EVO Ascent are MSR’s most versatile snowshoes – good for those who like to get off the trail and explore the backcountry on their own terms. Their Unibody construction means they’re easy to walk in while the TriFit bindings makes them easy to put on and adjust to your own feet. Whether breaking trail through powder (with the Evo Tails) or crushing a hardpack slope to the pass, these MSR Snowshoes are a great option. We use these snowshoes all winter, whether out for a family snowshoe in the Rockies or more challenging routes deep into the backcountry. The Evo Ascent are great off-trail, and we like their performance for getting up icy inclines. The unibody decking and steel traction rails excel on packed, icy snow, but you’ll likely want flotation tails (sold separately) when trekking on deep powder. Unibody Construction. The plastic unibody decking is tough and durable, but still has just the right amount of flex for climbing and trekking on uneven ground. 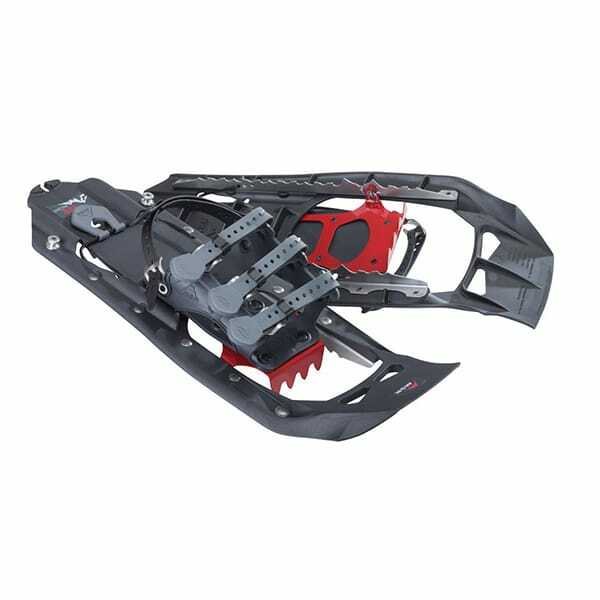 The steel traction rails and brake bars are molded in, which helps traction on icy surfaces. Versatility. These snowshoes perform almost any snow, but we thought they especially killed it on icy crust and pack. When you need to cross deep, fluffy powder, attach MSR’s flotation tails. Value For The Money. There are cheaper snowshoes, but few offer the value the Evo Ascent do. From the bombproof unibody decking to the versatile traction, these snowshoes hold their own against pricier models. Easy TriFit Bindings. We love the TriFit bindings MSR uses on these. The straps are easy to use without taking your gloves off and are freeze-proof, so they won’t snap or get stuck on your feet. We found they worked on a variety of boot sizes. 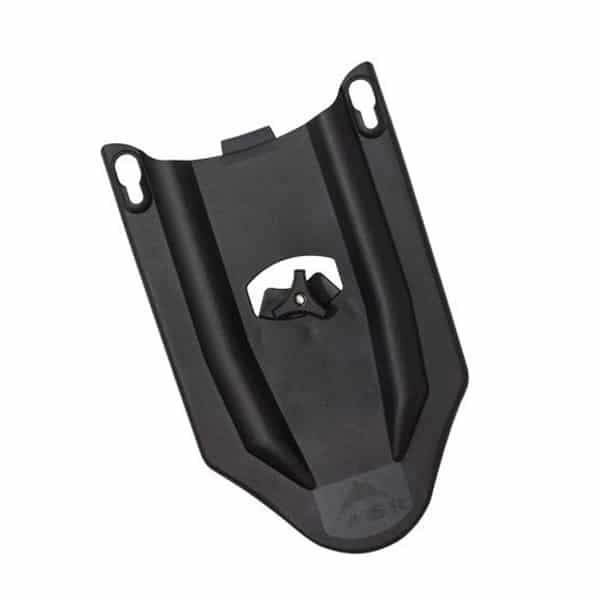 Plastic Braking Bars. We wish the braking bars behind the heel were steel, like the traction rails are; this would certainly help traction on downhills and slippery slopes. Not Enough Flotation For Heavy Loads. At 22”, these snowshoes simply don’t provide enough flotation for hiking with heavy packs-or for particularly heavy hikers. Regardless of weight, you’ll need the Evo Tails if you are breaking trail in deep powder. These snowshoes are plastic, but plastic doesn’t always mean flimsy; they’re actually tough, and you can feel it. The Unibody design puts the traction rails and braking bars molded right into the decking, creating a single, one-piece shoe. This has a few benefits. 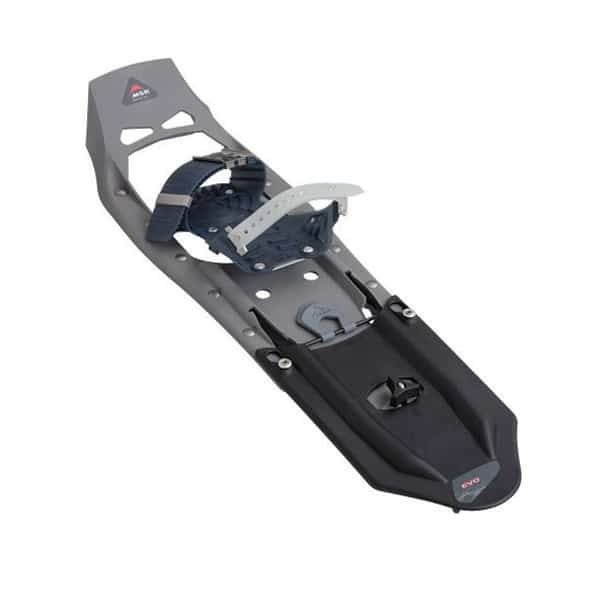 The first is added strength; unibody snowshoes are tough, with less rivets and moving parts. 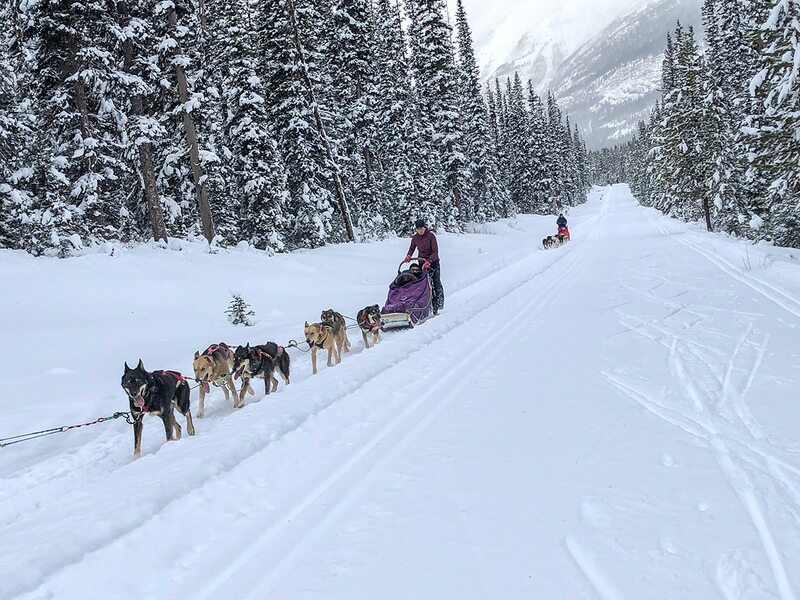 Second is the lesser likelihood of getting caught on small branches, rocks or brush when venturing off-trail; these can all get easily caught in gaps or holes in traditional snowshoes.  This isn’t a major concern on most of our local hikes but makes the Evo Ascent’s popular with hikers who frequently find themselves bushwhacking. Still, the plastic decking is very flexible. We found it had just the right amount of flex to grip comfortably onto uneven terrain, whereas stiffer shoes sometimes have trouble adapting to icy or uneven surfaces. Climbing up, down and around packed snow and icy crust was easy, we never felt encumbered or unstable. Our only complaint with this design is that the horizontal braking bars are plastic; when you’ve got steel traction rails and crampons underfoot, why not go all the way and put in steel braking bars, for better traction all around? We were also impressed with how light these shoes felt on our feet. At just a hair over 4 pounds a pair they certainly aren’t the lightest snowshoes ever – but certainly not the heaviest either. Worn on heavy winter boots, they were barely noticeable. 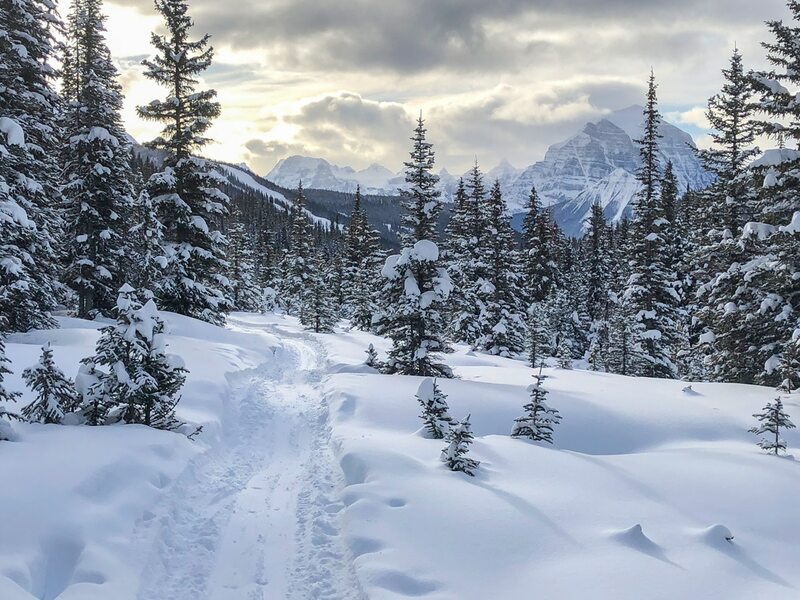 At 22” long, these snowshoes are nimble – but aren’t the best for walking on deep snow; there just isn’t enough flotation, especially with a heavy pack. MSR says their max weight capacity is 80 kilos – hardly enough for a big guy. Add on some MSR flotation tails, however, and that increases to a more manageable 114 kilos. To aid with uphill climbs, MSR included Televator Heel Lifts. They’re small metal rods that flip up underneath your heel. By raising your heel, they allow for better traction with the crampons as you ascend, and – more importantly – help reduces strain on your calves. Standard heel lift stuff, but we liked them a lot. They certainly made going uphill easier, and helped the crampons on the Evo Ascent dig more firmly into the snow and ice. The heel lifts are easy to flip up; they have a large pull tab that works with your mitts. But they aren’t so easy to flip back down when you’re back on flat ground, and might need to hit them with an object to fold them back in. Any experienced (or heck, totally inexperienced) hiker knows how annoying it is to fumble around with straps with heavy winter gloves on. MSR certainly knows , and designed straps on their TriFit Bindings large enough to work with mitts. We really liked that. There’s three of them – hence the name – and their all freeze-proof, too. We found they stayed flexible and useable in any alpine cold. Compared to many snowshoe bindings, the TriFit straps are a snap to put on, too. Much less finagling and fitting of boots and straps; just buckle them on. If you’re just getting started with these snowshoes, we recommend using a seat the first few times you do them up, as it does take some experience to get used to putting these on. We’ll say it again: We really like these snowshoes. We’ve worn them all winter long here in the Canadian Rockies and will be wearing them through the spring. We’ve been more than impressed with the light weight, excellent traction and versatility, as well as the comfort and ease-of-use they offer. They may not have the same level of ultralight weight and aggressive traction that more-expensive, snowshoes have, but they’ve got everything else we look for in a high-quality, entry-level snowshoe. Throw in some flotation tails and you’ll be ready for all but the most technical of mountain terrain. I got these from an Alaskan Guide in 2006. Have they changed the model at all..? It looks pretty similar. These puppies worked on any terrain and when I was at my fittest (~230lbs) the tails worked great. Though snow quality will have a lot to do with whether they totally fail or not. Wind Slab yes, fresh powder no (sinks about a foot)..
February newsletter – New website launched!